Hi! I'm Carrie, from carriebee.wordpress.com. I wanted to share a couple of my favorite binding tutorials today. The first is Heather Bailey's binding tutorial. It's a basic binding tutorial with clearly illustrated steps, and it's how I've been doing my binding for years. 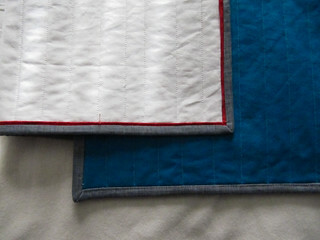 I highly recommend it if you don't mind hand-stitching the binding on the back of the quilt. If you want to completely machine-stitch your bindings, I recommend Susie's magic binding technique. You first attach the binding to the back of the quilt, then "stitch in the ditch" along a small flange on the front of the quilt. It's really easy, and stitching in the ditch hides . Below is a picture of this binding technique on a quilt I finished in January. Other good tips for binding are using Elmer's school glue (as recommended by Roxanne) or an awl (as recommended by Stephanie). I used an awl for the quilt above and I plan to use Elmer's on my next quilt.